Silk flowers are sold by stem, for you to make your own bouquets or to decorate with. 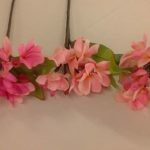 Silk frangipani stems 30cm long suitable to make wedding bouquet or to decorate receptions. Stem includes 8 flowers, 3 buds, 2 green leaves. Great quality! !